186 x 130 mm. – 61 leaves. 51 initials supplied in red. Second Latin edition. Mandeville accounts of his journey to the Holy Land and beyond: India, Tibet, China, Java, Sumatra, Egypt and North Africa. Full title: Itinerarius a terra anglie in partes ierosolimitanas et in ulteriores transmarinas. At the very beginning of printed travel literature stand the tales of the English knight Sir John Mandeville, whose narrative describes extensive and often rather incredible adventures outside Europe to the East in the first half of the 14th century. The authenticity of Sir John Mandeville and his travels to Palestine, India, China etc. have been matters for debate for centuries – what is undeniable is the popularity of the travel narrative, which was the most widely read of its time. This is the second Latin edition of the famous work. 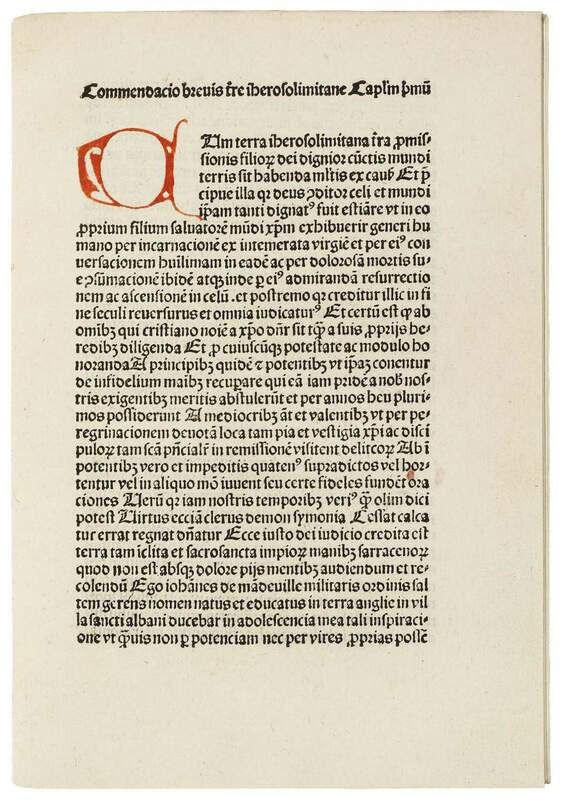 This edition is evidently preceded only by the Zwolle edition of Pieter van Os, 17 September 1483, which survived in one copy only.